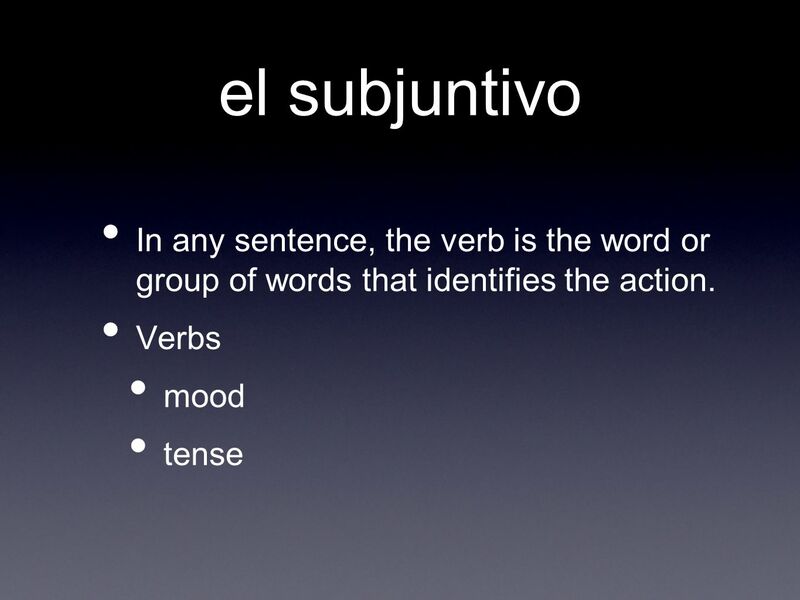 La introducción al subjuntivo 02-22-12. el subjuntivo In any sentence, the verb is the word or group of words that identifies the action. 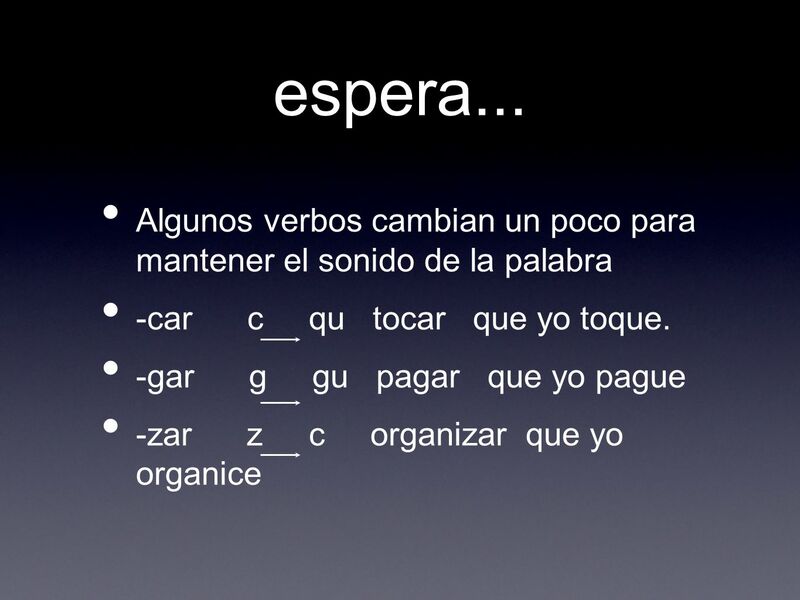 Verbs mood tense. 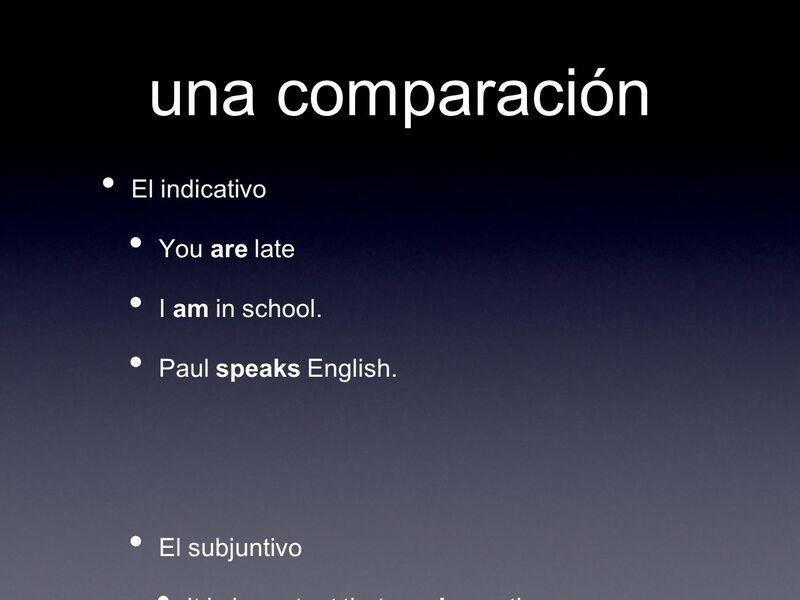 5 una comparación El indicativo You are late I am in school. Paul speaks English. El subjuntivo It is important that you be on time. I wish I were on vacation. The teacher insists that he speak spanish in class. 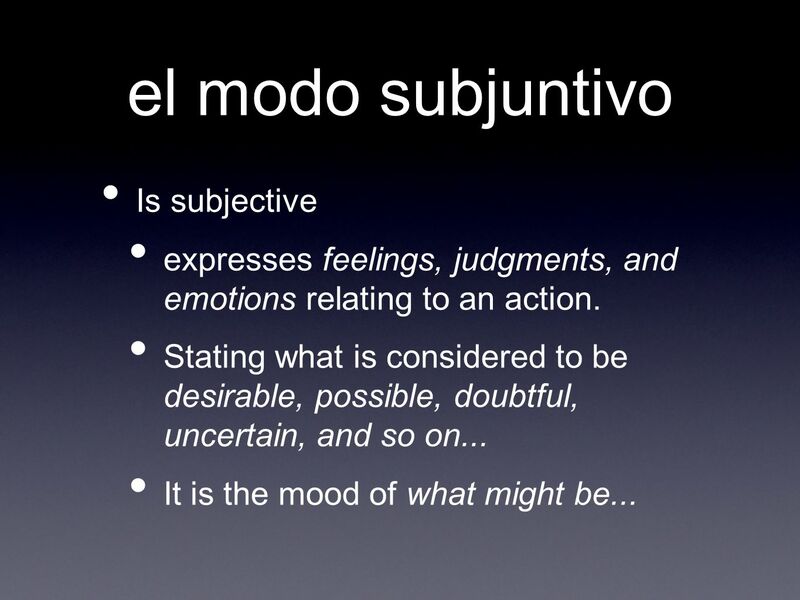 6 El español y el subjuntivo The subjunctive is used frequently in Spanish as apposed to English. 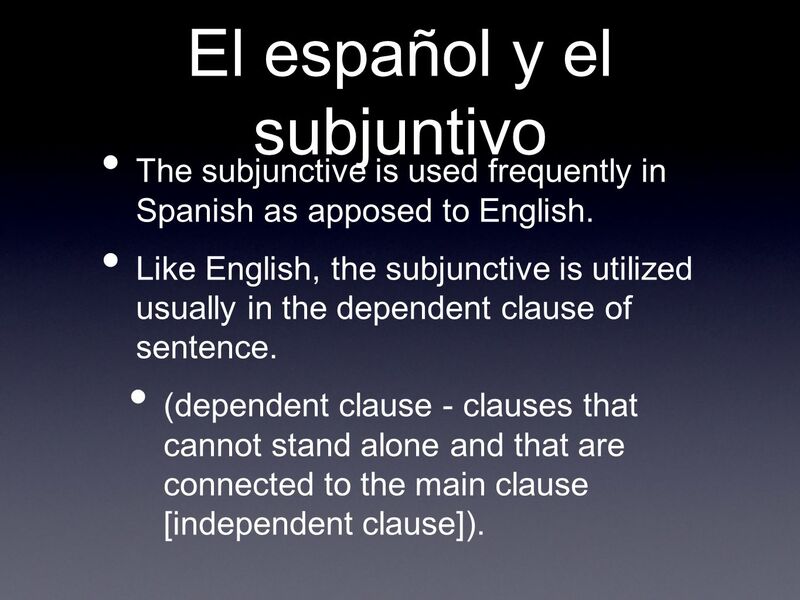 Like English, the subjunctive is utilized usually in the dependent clause of sentence. 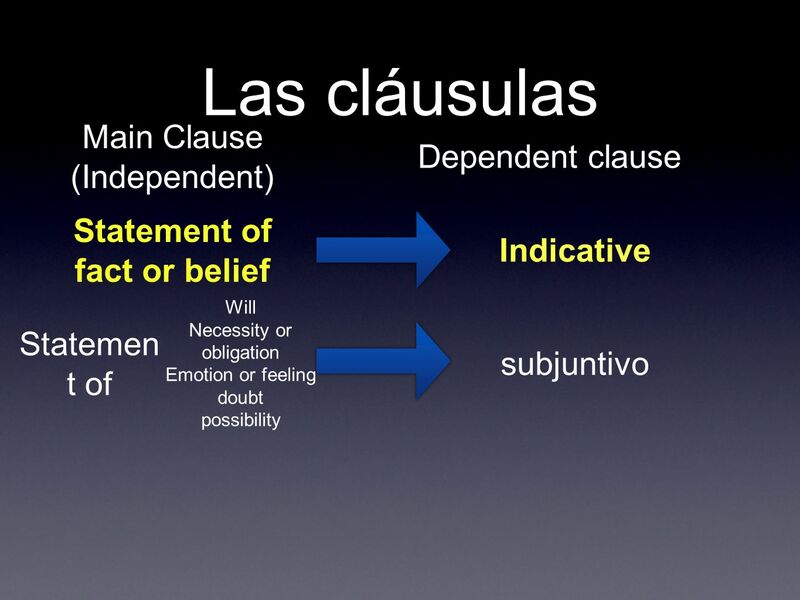 (dependent clause - clauses that cannot stand alone and that are connected to the main clause [independent clause]). 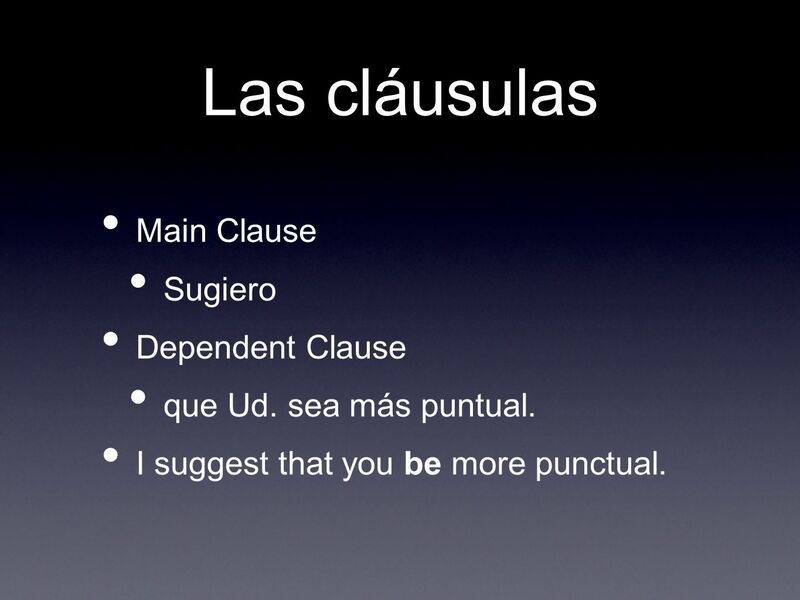 7 Las cláusulas Main Clause Sugiero Dependent Clause que Ud. sea más puntual. I suggest that you be more punctual. 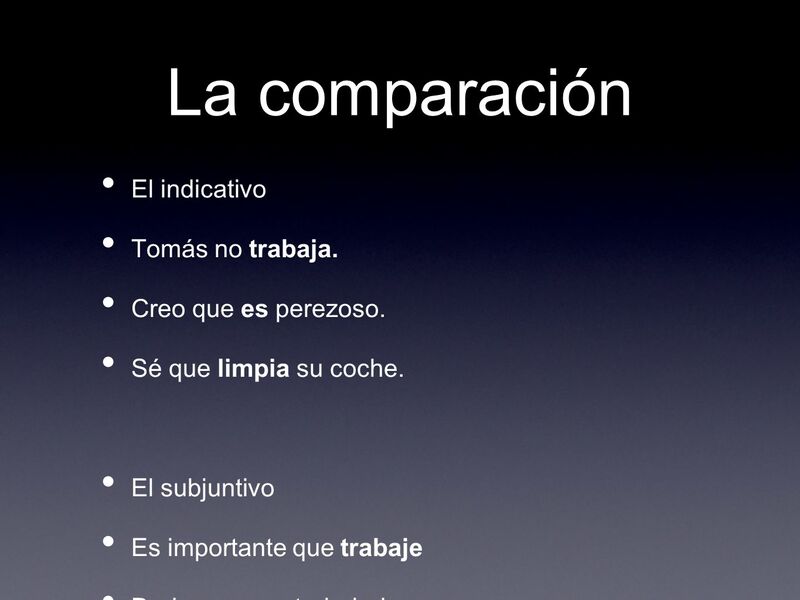 8 La comparación El indicativo Tomás no trabaja. Creo que es perezoso. Sé que limpia su coche. 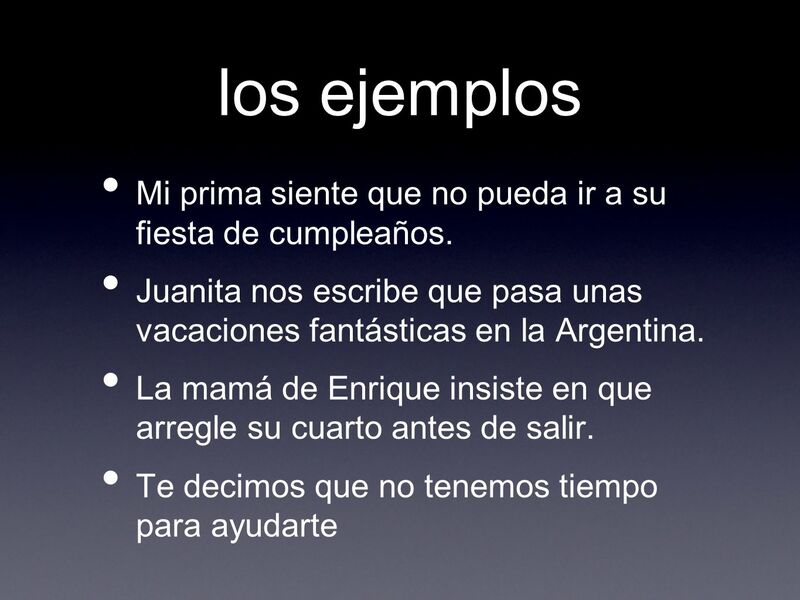 El subjuntivo Es importante que trabaje Dudo que sea trabajador Quiero que limpie su cuarto también. 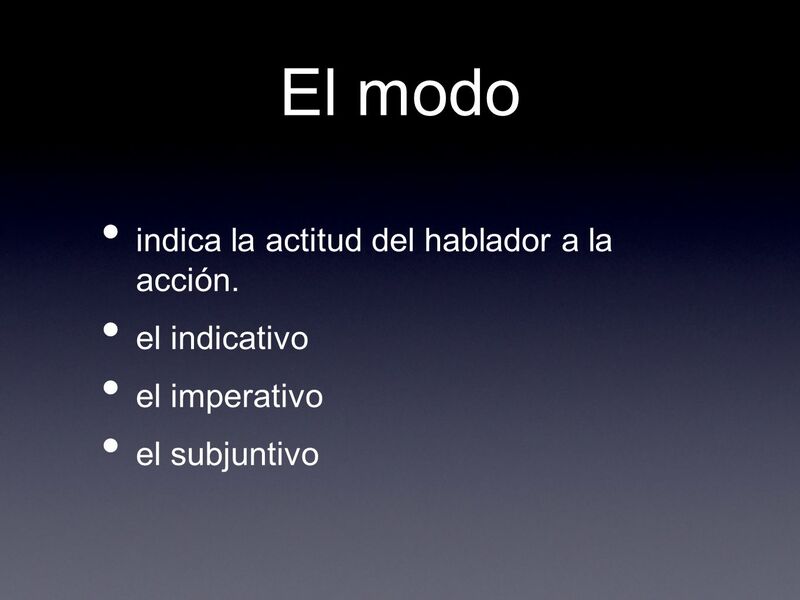 9 el modo indicativo Is objective Describes facts States what is considered to be certain. It is what is. 13 Los ejemplos Los estudiantes están seguros que no necesitan un examen final. No sabemos dónde guardas la aspiradora. 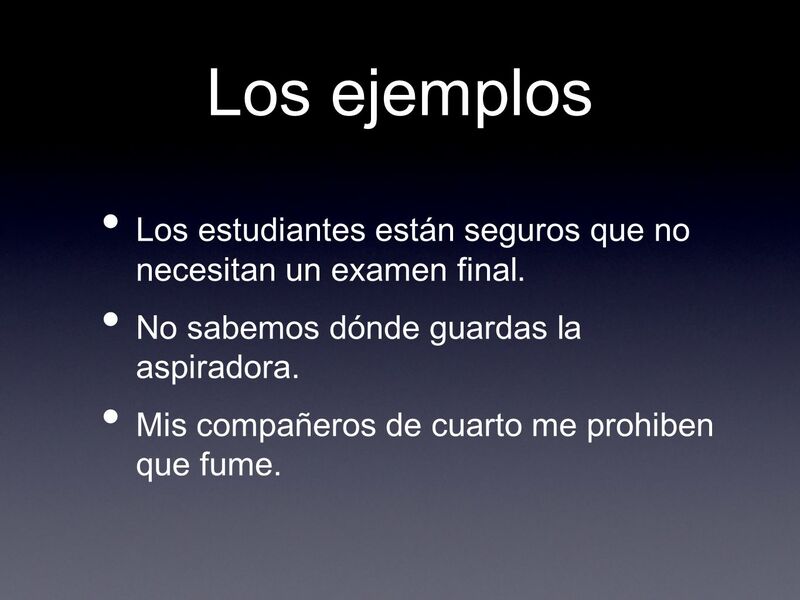 Mis compañeros de cuarto me prohiben que fume. 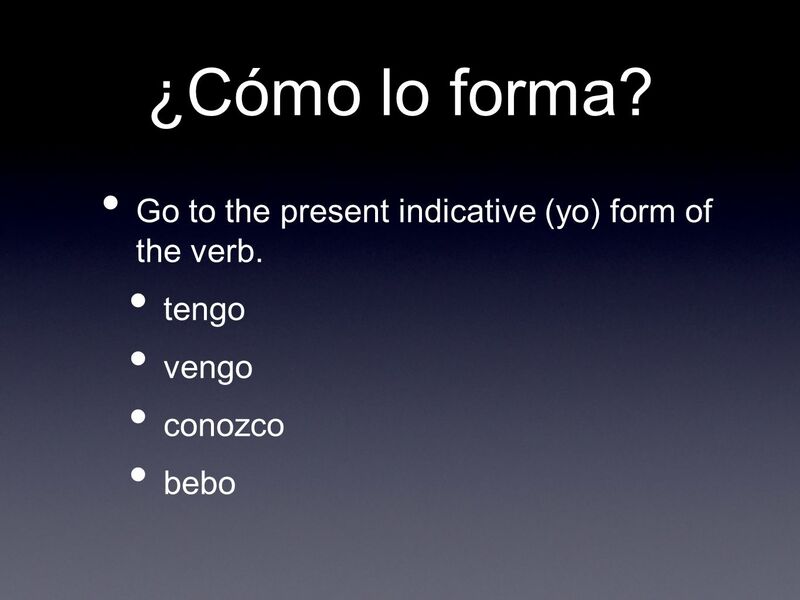 15 ¿Cómo lo forma? 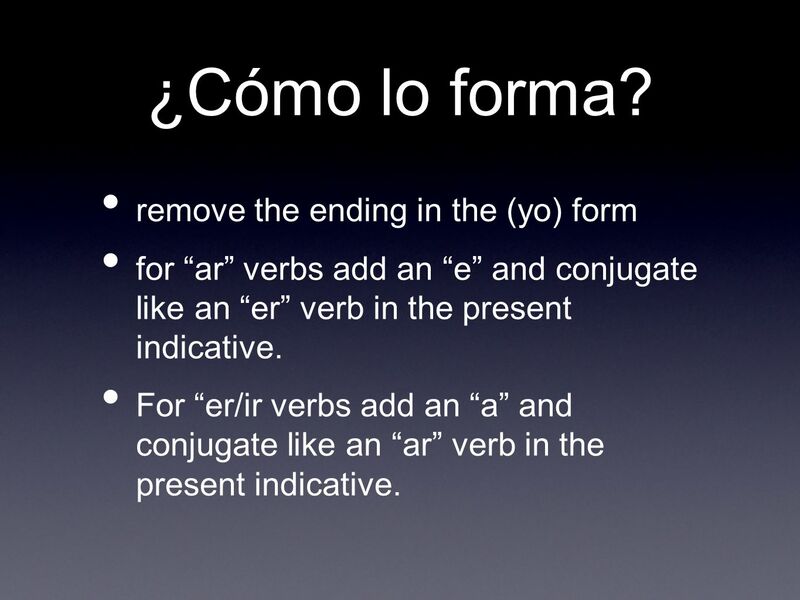 remove the ending in the (yo) form for ar verbs add an e and conjugate like an er verb in the present indicative. 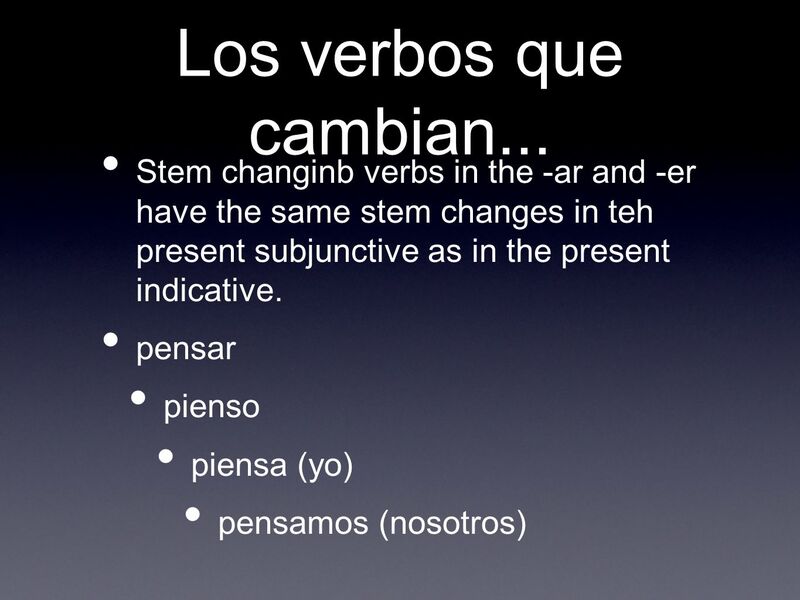 For er/ir verbs add an a and conjugate like an ar verb in the present indicative. 18 Páginas 74 y 75 lista básica de la conjugación. 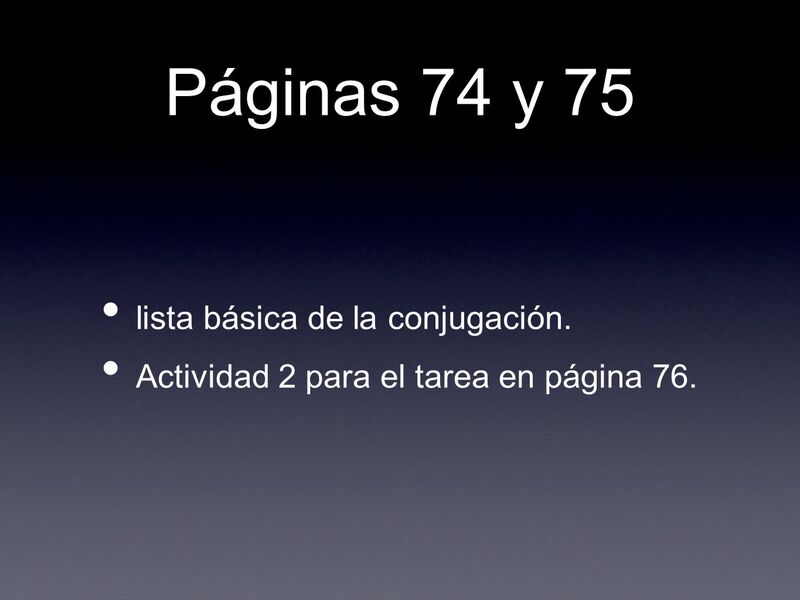 Actividad 2 para el tarea en página 76. 19 ¡La voluntad! 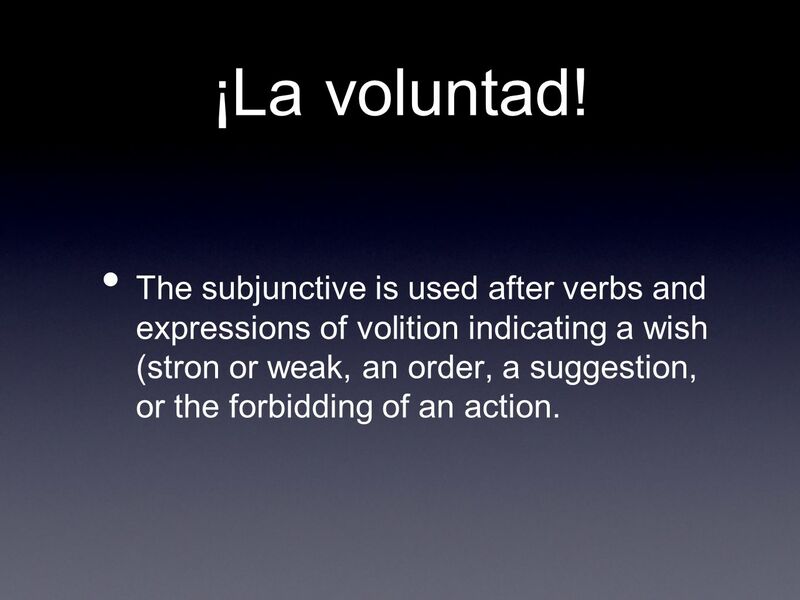 The subjunctive is used after verbs and expressions of volition indicating a wish (stron or weak, an order, a suggestion, or the forbidding of an action. 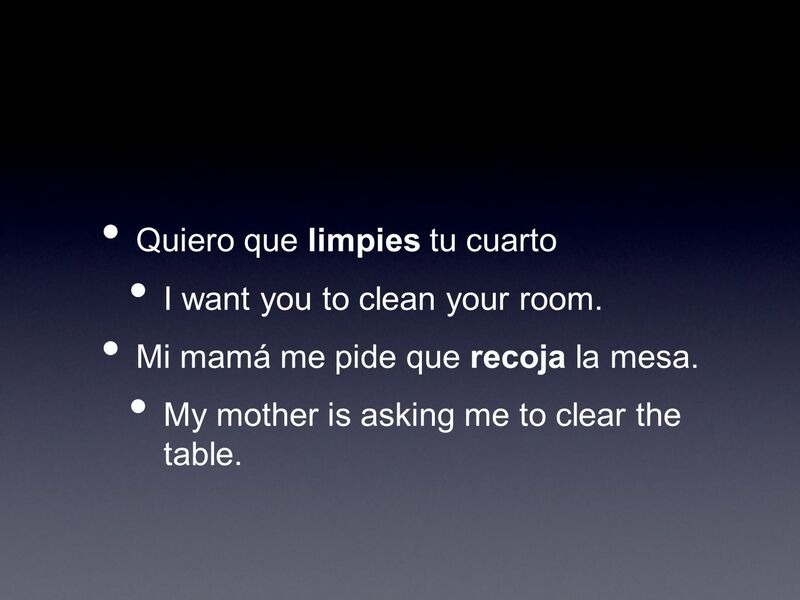 20 Quiero que limpies tu cuarto I want you to clean your room. Mi mamá me pide que recoja la mesa. My mother is asking me to clear the table. 21 Te prohibo que fumes en mi cuarto. 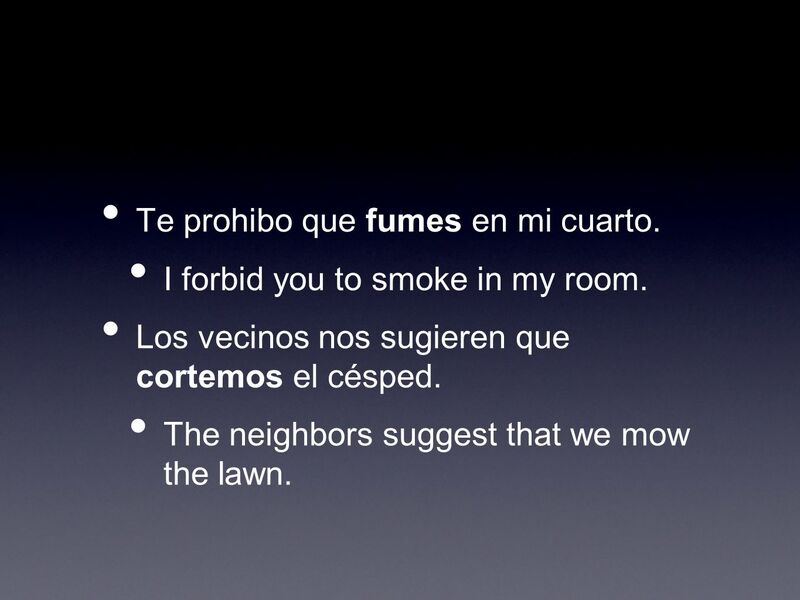 I forbid you to smoke in my room. Los vecinos nos sugieren que cortemos el césped. The neighbors suggest that we mow the lawn. 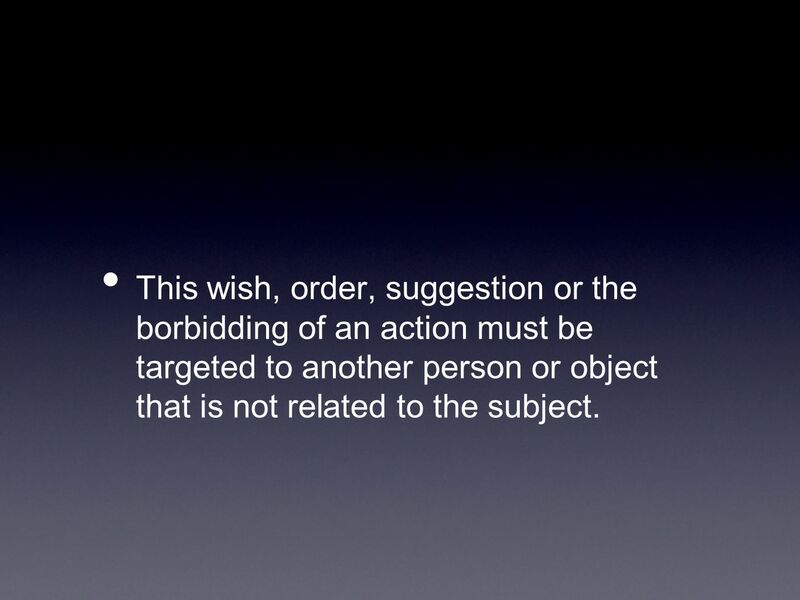 22 This wish, order, suggestion or the borbidding of an action must be targeted to another person or object that is not related to the subject. 23 Quiero salir I want to leave. The action ONLY concerns the subject. 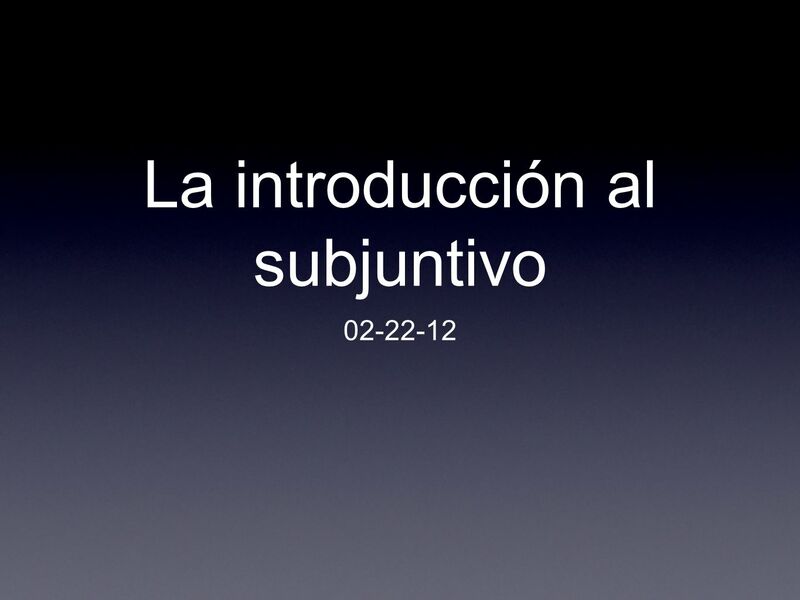 Descargar ppt "La introducción al subjuntivo 02-22-12. el subjuntivo In any sentence, the verb is the word or group of words that identifies the action. 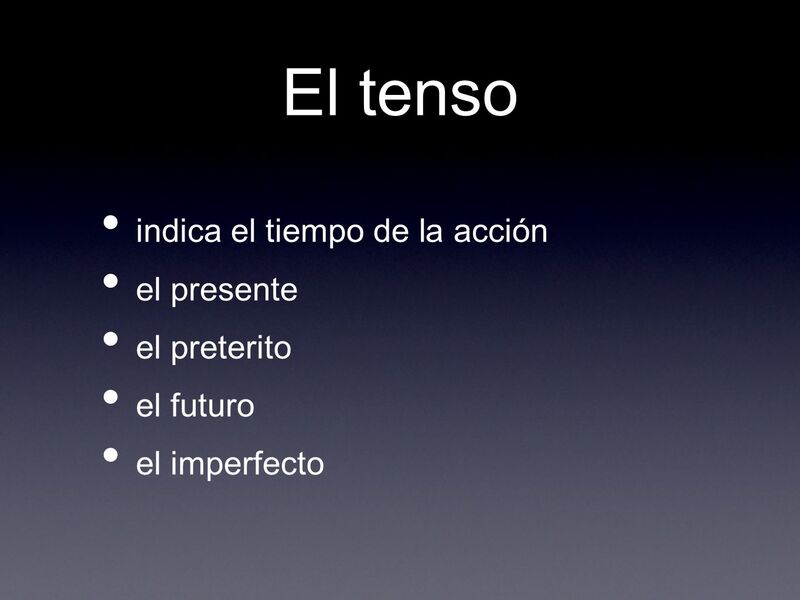 Verbs mood tense."